It's something I designed before I had children, but had the younger generations of girls in mind when I did. I hoped that if girls see how God values them, they would struggle less with peer pressure, low self-esteem, etc. It reads "I am fearfully and wonderfully made – Psalm 139:14." It was a product I carried in my [old] online store. I saved one for my daughter when she came along ... she's not yet 4, but I hope in the future it will be a positive reminder to her of her heavenly worth! :-) I had a stencil custom made for manufacturing these, but it's easily something you could replicate with alphabet stencils or even freehand. Try a rectangular mirror for an easier go at it! Also, I sold these in several color options and not just for girl bedrooms, either. In fact, I think the powder room was a popular destination! Don't we all need to be reminded of this verse? My name is Maria Edi and I am writing from Brazil. I am writing this to tell you that I like your blog very much and this inspiring mirros is very, very beautiful. They are not the seventh art, but I enjoyed making them. I LOVE that mirror. It's beautiful. I have a daughter who is almost 3 and something like this would be great for her room. Thanks for sharing. I found your blog through a friend's blog. I love it and am so glad I did! I did enter your contest/giveaway, but I wanted to let you know that I have loved looking at your entire blog and borrowing ideas! Keep 'em coming. I especially liked the simple candle/label one and made something like that for my sil's birthday yesterday. Thanks! What a great message for a mirror and actually everyone. Thanks for the inspiration. That is a GREAT message to put on a mirror!! we all need to be reminded! What a wonderful scripture to imprint on your daughter's mind every day. It is so important for all kids, but I think especially girls, to realize that this scripture is true and meant for them! What an awesome idea! You know, since visiting your site I am constantly trying to incorporate scripture all over our house! I'll show you all your inspiration once I complete the projects that are dangling in my mind! Hi, I had to buy your book. It just came today. It's wonderful. Congrats!! If I don't win a book, I may purchase one for my mom for Mother's day. It's just beautiful. I plan to decorate with the book also. 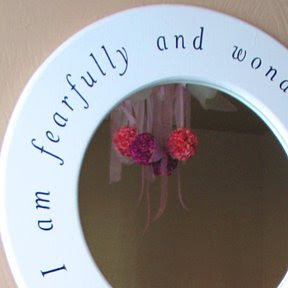 I love that mirror, what an appropriate verse for a daughter's room. Where can we get the mirror. Do you make them for adults..I need one. Thanks. Beautiful scripture and such a perfect way to be reminded of it. I noticed in a previous comment that you have a book. I'm off to investigate further. I am touuched by your creativity and inspiring ideas. What a beautiful scripture to put on a mirror. Thanks so much for sharing. I have 3 daughters and this is such an important reminder... thanks again for all your beautiful and inpirational ideas. 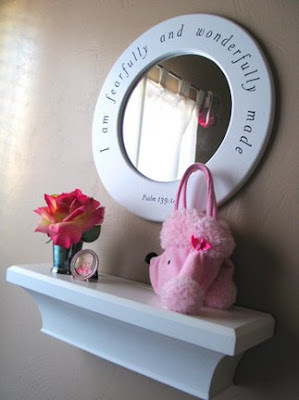 I love the mirror -- that is a great idea! I love it. It's on my list for spring projects. Love your creativity! I love the heart behind that mirror!! You go, you creative momma, you! I have four daughters and that mirror represents my #1 prayer for them...that they will never second guess their worth and beauty. Thanks for the wonderful mirror and scripture.I know some big gals that need to be reminded of this, what a gift idea ! Bless you and your line. Wow.. There are SO many comments on that giveaway! When I commented I thought I had a shot.. haha NOT so much anymore! I love the mirror. It is very beautiful! Love the mirror. You never cease to amaze me with your talent. Psalms is such a good book of the Bible. hi, i just stopped by and loved this idea, but if you use your own stencils, what would you use to write it on the frame? special kind of craft ink, paint? enlighten me! If you are using alphabet stencils, then use stencil paint and brush. They are designed to not "bleed" paint under the stencil. You kind of tap, tap with the loaded brush as opposed to normal paint strokes. Hi, I was surfing the web and came across your inspirational mirror. This is gorgeous. I know this was years ago. Is there any way I can buy one still? I have the other ones already that are being sold through dayspring. Are there any more that you are making I have an idea for my new house and your work is amazing I would love to buy as many as I can get my hands one that are uniquely made like this. Do you have any more of these mirrors left? Thank you, Nadia, but I have no more mirrors.